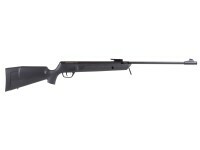 The Summit Ranger is an accessible shooter that’s trail ready straight out of the box. 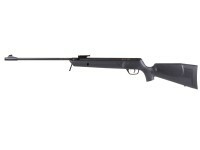 Featuring Crosman’s Nitro Piston 2 technology, this gun can shoot in cold weather conditions, remain cocked for hours, and shoot 80% quieter than most spring piston rifles. With practical features for field carry, the Summit Ranger includes an all-weather black synthetic stock with integrated sling mounts to add a strap for easy transport. Atop the stock is an 11mm Dovetail rail to mount your optics choice, or if you prefer, the Ranger has metal open sights—which is a nice touch over flimsy plastic ones. 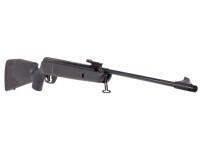 As an added bonus, this airgun includes Crosman’s Clean Break Trigger (CBT), an enhanced 2-stage trigger that’s adjustable. Best of all, these Summit Rangers are made in the US of A! All these features add up to a solid rifle that’s more than ready for shredding paper targets dispatching small game. Things I liked: I like the power but the pin on the rear sight keeps trying to fall out I put a scope on it anyway. Things I would have changed: different pin for the rear sight. What others should know: its a great gun like it a lot. Things I liked: accuracy with open sights. Things I would have changed: although the trigger isn't to bad, It is hard to tell when it is going to fire. The rear sight has a lot of play in it making it move up and down a lot. If you use open sights it will have to be shimmed. After shimming mine and a slow steady trigger pull I can hit tin cans at 50 yards. Things I liked: I have the Crosman Optimus as well. And this rifle will out shoot it every day of the week. By far more accurate and much more powerful. 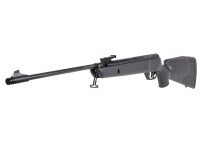 It is lightweight and the synthetic stock will holdup well in the field. While the scope is okay I shoot it with the iron sights and these sights are actually metal. It also seems to like a variety of pellets. I have used JSB, Crosman, RWS, and H&N and they all group well. Things I would have changed: While I love the metal sights I wish the front blade was not as high. What others should know: If you are looking for a great inexpensive.177 that is accurate and can take a beating this is a great choice. how can you mount weaver type scope rings on this rifle? What is the weight of trigger pull and is it adjustable? The only adj screw is to set the partition between stage one and two. To adj the pull wt you need to remove the trigger blade and swap out the little coil spring inside. I did and went from ~5lbs to <1.5. Misc spring I found at Home Depot and bent it until I was happy. The oem spring is .252" OD of .035" wire and ~.530" long. Pretty strong little guy. My new one is .026 wire and no doubt a weaker metal too. After you remove the stock I believe it's just one E-clip to get the trigger out. The sear will rotate down and spring should fall out. From there you'll see how it goes back in.